Remember, Antibiotics don't always work! 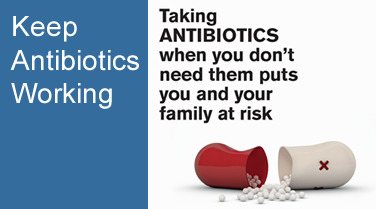 A recent letter to GPs from NHS Grampian served as a timely reminder that antibiotics are prescribed only when strictly necessary, directing all of us to the latest "Keep antibiotics working" campaign. This can be found here. If you would like to know more about self-care, and how we can avoid the unnecessary use of antibiotics go to Know who to turn to or the Antibiotic Guardian website. You doctor is not with-holding antibiotic medicines from you if they would benefit you, so please accept the medical advice if they suggest an alternative. Please do not call this number prior to 19/9/18, as it will not connect to the practice. Also, please remember to reprogram any speed dial options on home telephones and save the new contact number on mobile phones. Note that the old contact numbers will cease to accept calls from 19/9/18. As part of the transition to our new telephone systems, please note that with effect from Monday, 30th July our repeat prescription number for UDNY PATIENTS ONLY will change to 01224 551435. The old number will cease accepting messages from this date. We are now entering the final phase of our transition to our new hours and dispensing arrangements. Please keep up to date by calling back to our website regularly. Please see below for further details. As you are no doubt aware, NHS Grampian conducted a review of GP dispensing services which includes the service currently provided at our Udny Station branch. The consultation period ended on 1/10/16 and the decision made that the area in which patients can be dispensed to from Udny was to be severely restricted. Following an appeal and clarification being sought around postcodes and boundaries, the Board of NHS Grampian at their meeting on 7/12/17 determined that, while patients might suffer greater inconvenience by the proposed changes, they would not meet the definition of “serious difficulty” held to be within the legislation, and the original decision was upheld. As a result the practice will have no alternative but to reduce the service it delivers from Udny Station. The tapering period from the original decision expires on 27 July 2018, at which time our dispensing service to a large number of patients who are presently eligible to receive their medication in this way will cease. We estimate this change will result in a reduction of around 50% of the items we dispense which will have implications for the amount of doctor time we will be able to offer at Udny, though the practice has been trying hard to find ways of maintaining a service to our patients in Aberdeenshire. Therefore, with effect from Monday 30/7/2018 the practice will be offering GP consultations at Udny Station in the mornings only, and the surgery will be open to patients from 8.30am to 2.30pm Monday to Friday for appointments, advice and the collection of prescriptions. Please note that as we move through the final transition phase during July we will gradually realign staff hours with these arrangements. This means that there may be days when the surgery closes earlier than at present, so please call to check if you intend attending after 2.30pm. A map of the new dispensing area can be viewed by clicking the links below. If you currently have your prescriptions dispensed from Udny and do not reside within the area shown in yellow, then from 30/7/2018 we will no longer be able to dispense to you, and you should make alternative arrangements either to collect and take to the community pharmacy of your choice, or to choose to participate in a pharmacy collection/delivery service who already deal with the practice at Bridge of Don. This should be discussed with your chosen community pharmacy who will provide details if they have an arrangement with us. It is disappointing that we have been forced into this position, but we will do our very best to support our patients during this transitional period despite the reduction in our available resources. Further to our recent notices regarding the change from ordering prescriptions by email to our new, secure online portal please note that the email addresses are now closed for prescription requests with effect from Monday 8th January 2018. If you have not registered for our new online service then please got to the ONLINE SERVICES tab and download the pre-registration form. This should be completed and brought to the practice together with photographic id. You will receive an email with the necessary codes to complete your registration thereafter. Our other methods of ordering your repeat medication (e.g. telephone or ticked right-hand side of a prescription) remain unaltered. This new method of ordering is the first step in our expansion of online services, which will shortly include the ability to book and cancel appointments online, so please register now if you have not already done so. You will only need to register once to access the other services we introduce via this portal. We appreciate this registration process is a little inconvenient, but it is in the interests of your security online that we move to this system, and we thank you for your patience and understanding. If you have any problems registering, our staff will be happy to help. This practice, in common with the other GP practices in Scotland are now part of the Scottish Primary Care Information Resource (SPIRE) network. SPIRE will be used to help plan for Scotland’s health and care needs. It uses information from GP practices all over Scotland in a safe and secure way. Being able to use this information will mean NHSScotland can improve the quality of care for all patients, better plan services for people with health needs and support research into new treatments for particular illnesses. You have a choice about the information from your GP patient record being used in this way. If you wish to object to the use of your data for these secondary uses please speak to any member of staff or complete the opt-out form below. 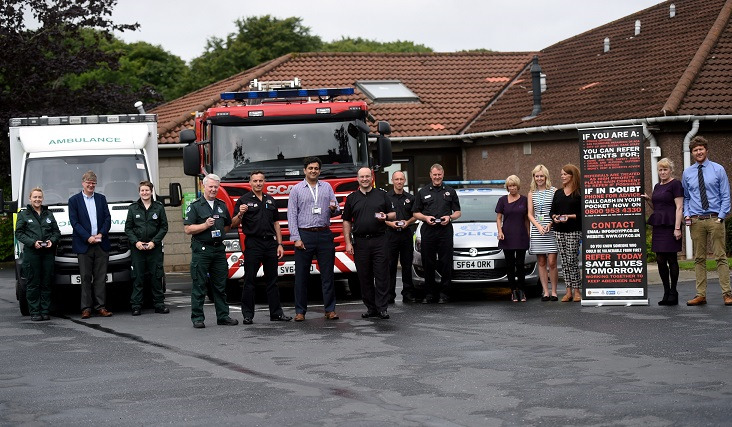 Scottish Fire and Rescue Service in partnership with Police Scotland, SAS and Aberdeen City Health and Social Care Partnership/NHS Grampian launch the Cash in Your Pocket network number to refer clients for Home and Fire Safety Visits at Scotstown Medical Centre on the 20th of July 2017. Scotstown Medical Group are pleased to be associated with such a worthwhile undertaking. The picture above shows Drs Gupta and Crockett together with staff and representatives of partner organisations at the launch. It should be noted that the review group has used a postcode of AB41 0 to define part of the area within which we can dispense, but this code has been retired. We will be seeking clarification on this as well as some other matters and will upload the full documentation as it becomes available to us. Nevertheless, it is good news for our Udny patients that we should be able to continue dispensing in some form, and we have a transition period during which we will seek to maintain the current service while we taper down to our new, smaller dispensing area. Further changes will be reported here. Our current email service for repeat prescription will close on September 30th 2017. Please ensure you have registered for our new online system in plenty of time. Click on the "Online Services" tab to learn more. NEW online prescription ordering service. Please note that we will be moving to a new online ordering system for repeat medication, replacing the current email prescription addresses. patients will be required to register for this new service by completing the form in our "Online Services" tab and returning it to the practice with a form of ID. This is because the new system draws its information about your medication directly from your clinical record. So if you are a current user of either our email or website ordering system, REGISTER NOW to avoid any delays in moving to this new, more secure service. The existing email system will continue for the moment, but it will be closed down later in the year. So please don't delay - complete your pre-registration form now. With effect from 21 November 2016 all requests for urgent/on the day appointments and acute home visits will be triaged by our urgent care team. Patients should be prepared to give brief details to reception staff when calling, which will help the team prioritise calls when calling back. Non-urgent requests will remain bookable in advance. We hope through this measure to ensure that those patients with the most urgent needs are seen quickly. The practice has written to patients explaining these changes in greater detail, and a copy of the letter is available to view by clicking on the icon below. Should anyone wish to attend and make representation to the Review Group they should make an appointment to do so. Instructions are contained in the information sheets below. The consultation period has ended and the practice submitted its response in the time given. In addition, the practice has written to dispensing patients with a copy of our response, which we attach below together with the letter to patients. A meeting was held at Udny Station Community Centre, organised by Mr William Grant, Chairman of Foveran Community Council and chaired by the Secretary of Foveran Community Council Mr Glen Douglas. It was attended by local MSP Gillian Martin, Councillor Richard Thomson of Aberdeenshire Council, Mr Brian McDougall of Udny Community Council, Dr Alasdair Forbes and representatives of NHS Grampian. The meeting was well attended and local people had the opportunity to voice their opposition to any change in dispensing services at our Udny Station branch. Full minutes will appear on this page soon. Grampian NHS Board will meet today at 2.00pm in the conference room, Summerfield House, Eday Road, Aberdeen to consider a supplementary paper concerning the review of dispensing services at Udny Station and others. Based on the original submission this document will present more detail surrounding the consultation process which is due to run for a period of 90 days commencing 4 July 2016. These board meeting are held in public and the papers are available to all interested parties. The documents are available from the NHS Grampian website www.nhsgrampian.co.uk and for the assistance of our patients we have uploaded them here. Just click on the icons to view. Following the recent announcement on Radio Scotland and the subsequent article in the Press and Journal we can confirm that the dispensing service at the Udny Station surgery is to be included in a review of GP dispensing services throughout Grampian. The practice had no prior knowledge of this decision and is currently seeking clarification from the Health Board on this matter. We appreciate this may be a cause for concern to our patients, but we will keep everyone informed if and when we become aware of any changes to the position. As things stand currently, the review panel has not yet been constituted so we do not know who will be involved or what their terms of reference will be. Rest assured that we will continue to dispense to our Udny patients while this process is undertaken and there will be no change to the excellent service provided by our team of dispensers at Udny, which we know is highly valued by those who use the service.